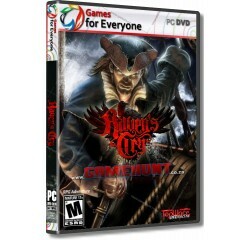 Raven's Cry - 2 Disk - R200,00 : Game Hunt, Where we lead, others follow. "Raven's Cry" is a third person RPG-adventure game that combines fast-paced swordplay, thrilling naval battles, and free ranging explorations through undocumented islands and historical towns. A cadre of colourful cutthroats will cross your path on your travels, all with their own motivations and plans, but make sure to choose your crew with care! Beautiful cinematic cut scenes bring Christopher's dark quest to life. The open world of the Caribbean features a robust core storyline as well as dozens of side quests and secrets waiting to be explored. Countless activities to take on, from smuggling and looting to treasure and bounty hunting. Morally grey decisions influence the story and character interactions, creating a unique gaming experience. Complex and unique skill trees on both land and sea are affected by Christopher's notoriety level. Unlockable raven skills give your bird more to do than fly around, as it takes an active role in your adventure. A challenging fighting system based on classic hack'n'slash action and tactical free-flowing combat includes blocks, counters, parries and finishing moves. Special combos with the unique and brutal hook. Fighting influenced by your surroundings; wet pistols may not fire, and muddy swamps will slow your offensive and defensive actions. Intense naval battles with myriad ships and multiple ammunition types replicate the brutality of historic naval battles. Notoriety and interchangeable flags influence the behaviour of the different controlling factions in the Caribbean. Extensive economic system; knowing where to sell coffee, chocolate and Marijuana and other supplies will give you maximum return on your cargo. Detailed and realistic locations in both the Caribbean and South America. Processor - 2.0 GHz Quad Core® or equivalent AMD® processor.